For whom, exactly, are we producing? It goes without saying that the world’s productive, stuff-consuming population is always increasing, that there are forever more productive workers in the pipeline, more and growing future salaries to pay for things. The global economy is the sum of its production of goods and services versus its capability to consume those. This article will outline the mismatch of fast-rising capacity versus the deceleration of consumptive capability. I really want to focus on the childbearing population (ages 15 to 45 years old) and births to show what is taking place and what is yet to come. The global economy is set to continue increasing its capacity to produce more and produce it more efficiently. However, excluding Africa, the populations capable of childbirth and their offspring are set to accelerate their declines...and resultant global consumption hopelessly overmatched versus the significant overcapacity being created. 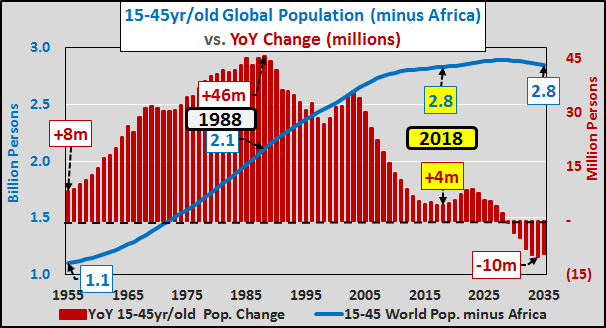 Significant depopulation of young populations is a given while elderly populations continue exploding. Only through this lens can one understand the true problems facing an economic system premised on infinite growth.